Disclaimer: I have received one pair of OOFOS for review and giveaway purposes. I bought the initial pair at Road Runner Sports. I was not requested to write a positive review. All opinions are my own and I have received no monetary compensation for this post. Welcome to Day 4 of 11 Days of Giving! Thank you so much to OOFOS but most of all, thank you for you! What a great end to the year giving away 11 of my very favorites! 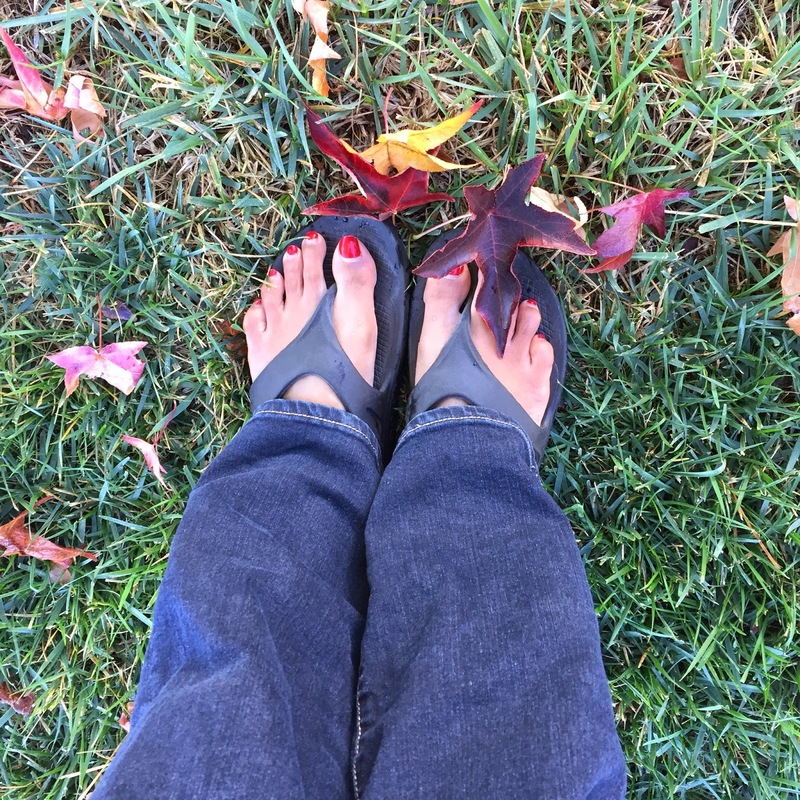 When my friend Jen at Running with the Girls reviewed OOFOS, I knew I had to check them out. So, recently when I was at a Stretch Clinic at Road Runner Sports, I saw them, tried them on and walked out in them (come on! I paid!). They look like regular old flip flops but WAIT! They have 37% more shock absorption than any other foam material on the market. You literally step in to them and go, "OO!" See? That's how they came up with the name. See the beautiful arch support? And they are machine washable. So what does this mean for an endurance runner? Or any athlete looking to recover? It means that because there is 37% more shock absorption, 37% LESS shock is traveling up into your body when your foot impacts the ground. The shock is dissipated thru the shoe. Brilliant! And of course, they have cute colors. As my runs get longer, my recovery gets more and more important. So let me tell you, when I put on these shoes after a long run, I definitely feel the "OO." So you should try them. Many athletes have found improvements in knee pain and Plantar issues after wearing these. I even wear these to walk the dog in the mornings. I want every color! An #OOFOSRainbow! So your turn. 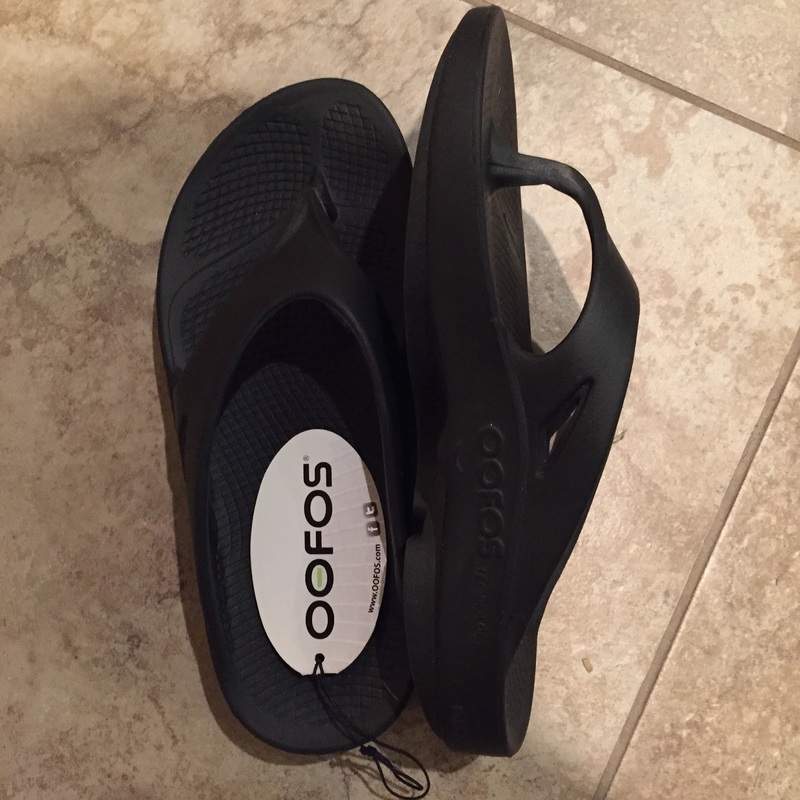 OOFOS has generously agreed to GIVEAWAY one pair of thong style to a lucky winner in the available color of their choice. Enter on the Rafflecopter. Winner will be provided the prize directly from OOFOS. Substitutions unlikely but may apply. SD Mom not responsible for failure of sponsor to deliver product. Good luck and get excited for Day 5 and a Lara Bar GIVEAWAY! The fuscia! I need these in my life! My knees and back always hurt these day, too! I'm going to have to look into buying myself a pair. These look super cushy and would be awesome after a long run. I love all the colors they come in too. I like that they take the pressure of your feet with the shock absorption and the vast selection of colors is a bonus! I'm intrigued by these, especially since they have arch support. I love the purple ones! My favorite color! I love the colors and footed technology. I would love to try these! I have had plantar fasciitis, so these would be really helpful! The arch support and color options have me interested. They are great for my high arches. I'd like to wear them for recovery after running. The arch support. I have flat feet and these would be great! I need sandals that offer arch support so these look great! Most important to me is the arch support. I've sworn off any types of sandals that don't offer good support. They look like they are super comfy! I like the impact absorption and the comfort! I love wearing flip flops, but hate the way my legs feel like jello after. These look amazing! Must get these shoes! They look amazing! These look amazing! They sound like they'd be perfect to wear after my long runs! They look SO comfortable. Also pretty sleek. I love all the colors of their women's sandals... I'm partial to PLUM! These are definitely better than flip flops. It kills me to see runners in flip flops. Regular flops require you to grip with your toes as you walk (so they don't fall off). This turns off all the mid-foot musculature, which is supposed to be firing while you walk. Essentially, walking in flops trains your foot to do the exact opposite of what it should be doing. Very bad! But these sandals are NOT flops. I can tell by the sculpted footbed and the positioning of the straps. All my distance runner friends say they are amazing, so I'd love to win a pair and try them out! I love the idea of having a sandal that's more supportive than a flip flop but just as convenient! I love all the fun colors, especially the aqua. I love that they are comfortable and have arch support. They look so comfortable for after a marathon! I like that they're COMFORTABLE casual sandals. Got these after the RunDisney Wine and Dine half and LOVED them on the plane ride home!!! I like the colors and they sound comfy. I've heard these are great for plantar fasciits. Would love to try these! I like the arch support, which you usually can't find in sandals. I love all of the cushioning of these sandals. Cushion & arch support! I am all about comfort after a race and these looks spectacular! I like that they are made with OOfoamTM and their patented footbed design which makes them very comfortable. I like the arch support. Plus, "insanely comfortable" grabs my attention too!